O kumusta ang wallet nyo pagtapos ng Pasko at Bagong Taon? Paldo pa ba o impis na? After all the expenses from 2017 Holidays, I know you are looking for tried and tested Ipon Challenge For 2018. I collected a few Ipon Challenge that people did last year (so awesome to say last year when it really is just a few days ago haha). 52 Week Ipon Challenge. I think this is still the most effective Ipon Challenge of all time. It works well for Filipino with weekly salary. You can start with 10 Pesos and increase the savings by 10 Pesos as weeks passes by. If you start on January 6, 2018, by December 2018, you will have 13K Pesos. 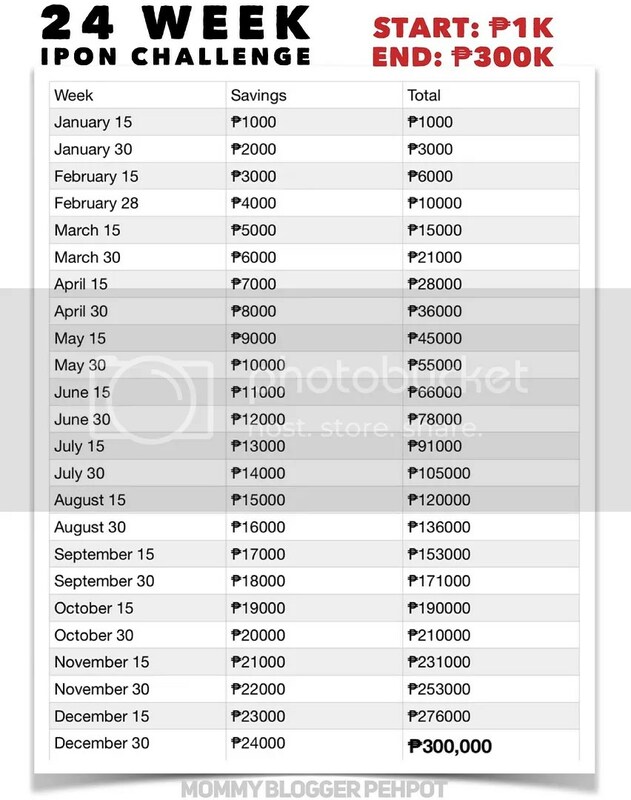 If you want to download the file for this one you so can see how much you need to save, check out Mommy Blogger Pehpot. 24 Week Ipon Challenge. If you happen to receive your salary twice a month, then this Ipon Challenge For 2018 is the best for you. Depending on your sweldo, you can try 100, 500 or 1000. That’s how much you can save if you start with 1000. This one is best for people who’s take home is 100K and up. Invisible Money Ipon Challenge. This is the simplest challenge and most fun actually. May variations ito. Pwedeng invisible 50, invisible 20 or invisible 10 and 5 (pang bata yan). Sa invisible 50 Pesos Ipon Challenge, all the 50’s go straight to your alkansya, easy as pie! Nag viral yung girl na sa loob ng 5 months, nakaipon sya ng 40K pesos. For 20 pesos, syempre all 20 pesos hindi nyo pwede gastusin. Yung isang nakita ko online, 1000 Pesos in 8 days lang. Teach your kids to save din using this challenge. Tell them about the invisible 10 pesos coin or 5 pesos coin Ipon Challenge. Goodluck sa Ipon Challenge ninyo this year! Please share the post to inspire other people to make ipon!